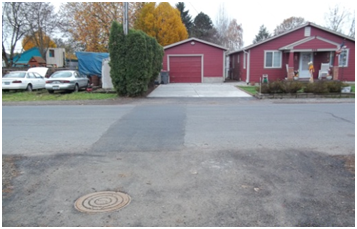 Project Description: A portion of the original sewer system in Dayton was constructed in 1964 through backlots to avoid placing sewer pipes along a state highway right-of-way, including the construction under a pre-existing garage. 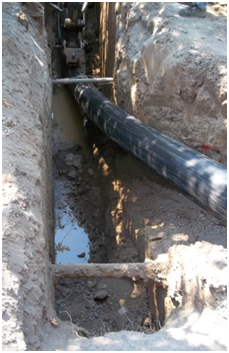 Deterioration of this pipe resulted in this pipeline having the highest measured I/I leakage rate in the City, and the expansion of the High School/Middle School campus and areas tributary to this sewer resulted in significant capacity issues and surcharging during wet weather months. Furthermore, the development since 1964 of extensive landscaping, trees, fences and the expansion of the garage made open cut replacement of this pipeline politically undesirable. 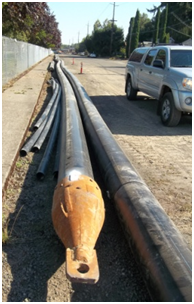 The existing 8-inch pipeline was replaced with a new 14-inch DIPS HDPE pipeline installed by pipebursting, which provided adequate capacity for the school campus and the future upgrade to the pump station discharging to this pipeline. Geotechnical evaluations were performed to verify that the oversizing pipe-burst was feasible. 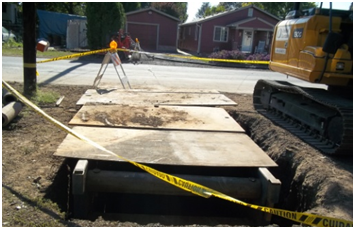 The project included upsizing and replacement of approximately 1,400 feet of mainline sewer including relief excavations at the garage foundations, 27 laterals and 6 new manholes.